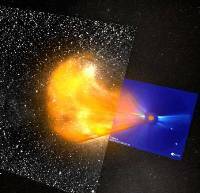 Twin NASA spacecraft have provided scientists with their first view of the speed, trajectory, and three-dimensional shape of powerful explosions from the Sun known as coronal mass ejections, or CMEs. This new capability will dramatically enhance scientists' ability to predict if and how these solar tsunamis could affect Earth. "We believe we can now predict when a CME will hit Earth with only 3-hours of uncertainty," says Angelos Vourlidas of the Naval Research Lab, who helped develop the model. "That's a four-fold improvement over older methods." Coronal mass ejections are billion-ton clouds of hot magnetized gas that explode away from the Sun at speeds topping a million mph. Sometimes the clouds make a beeline for Earth and when they hit they can cause geomagnetic storms, satellite outages, auroras, and power blackouts. The ability to predict the speed and trajectory of a CME is key to space weather forecasting. "This is an important advance," says Lika Guhathakurta, STEREO program scientist at NASA headquarters in Washington DC. "From a distance, CMEs appear to be a complicated and varied population. What we have discovered is that they are not so varied after all. Almost all of the 40-plus CMEs we have studied so far with STEREO have a common shape - akin to a croissant." Thousands of CMEs have been observed by NASA and European Space Agency spacecraft, but until now their common shape was unknown. That's because in the past observations were made from only a single point of view. The STEREO mission has the advantage of numbers. It consists of two probes that flank the Sun and photograph explosions from opposite sides. STEREO's sensitive wide-field cameras can track CMEs over a wider area of sky than any other spacecraft, following the progress of the storm all the way from the Sun to the orbit of Earth. "STEREO has done what no previous mission could," notes Guhathakurta. Vourlidas says he is not surprised that CMEs resemble French pastries. "I have suspected this all along. The croissant shape is a natural result of twisted magnetic fields on the Sun and is predicted by a majority of theoretical models." He offers the following analogy: Take a length of rope and hold one end in each hand. Start twisting the ends in opposite directions. Twist, twist and continue twisting until the middle of the rope is a fat knotted mess. "That's how CMEs get started - as twisted ropes of solar magnetism. When the energy in the twist reaches some threshold, there is an explosion which expels the CME away from the Sun. It looks like a croissant because the twisted ropes are fat in the middle and thin on the ends." The shape alone, however, does not tell the full story of a CME. The contents of the CME must be considered, too. How much plasma does it contain? What is the orientation and strength of its internal magnetic field? When a CME strikes, the havoc it causes will depend on the answers - answers the croissant model does not yet provide. "There is more work to do. 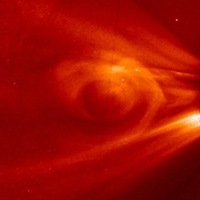 We must learn to look at a CME and not only trace its shape, but also inventory in contents," says Guhathakurta. "We are halfway there." Eventually, the quest to learn what lies inside the croissant will be taken up by other spacecraft such as the Solar Dynamics Observatory, slated to launch in August 2009, and Solar Probe+, a daring mission (still on the drawing board) to fly close to the Sun and actually enter these storms near their source. STEREO isn't finished, though. The two probes are continuing their journeys to opposite sides of the Sun for a 24/7, 360-degree view of the star. Along the way, they'll actually run into a few CMEs and have the chance to sample the 'croissants' in situ.